I've been brainstorming on a new hairdo and / or hair color for a couple of months now, but I've still been undecided. It can be quite frustrating to think of something new if you've had every (hair) color of the rainbow -- literally; just click HERE to see an example. My parents have never limited me in my looks and trying out new and different things with it, something I still thank them for and will pass on to my children. Anyway, I was browsing around Tumblr to soak up some inspiration, when I stumbled upon the best hair color I've seen in a long time. 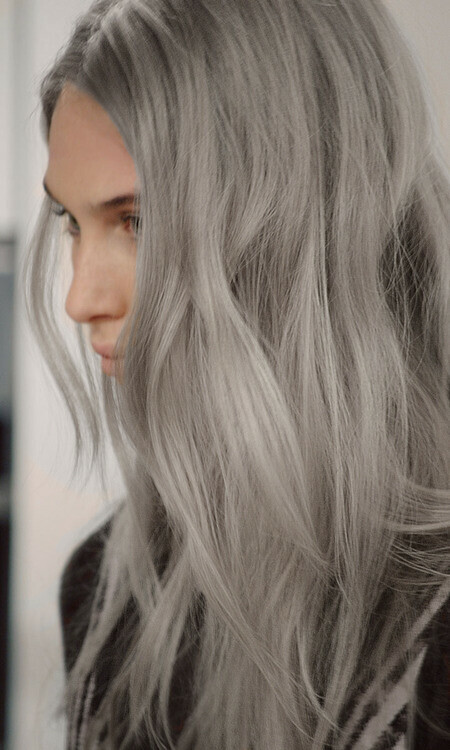 How insanely gorgeous is that grey hairdo? I'm already imagining myself with it, but there are some things that I have to keep in consideration -- boo! * School / Work: First there was school I had to think about, now it's work. Aside from the blog, I'm also working as a part time sales assistant. Are they allowing their employees to dye their hair grey, even if you can't really consider as an unnatural color? How will customers react when they are being helped by a 24-year-old with grey hair? I'm usually not one to care about what others think about the way I look, but it's work, so I don't really have a choice. * Colorist: It takes a top colorist to get to that shade of grey pictured above and even though all hairdressers know how to color hair, I trust only one with mine. It's the same colorist who successfully created the dip and dye I mentioned before and even though I'm pretty sure she can pull it off, I still need to talk about it with her first (if I'm even getting my hair dyed, that is). To me, it's important to have a one-on-one brainstorming session with my colorist first, going over all of the options, discussing certain problems that might occur and so on. * Hair: To achieve the color in the picture, there's no doubt that a lot of work will have to be done. This might be an issue that you might want to talk to your colorist about; as mentioned above. If your hair is thin, vulnerable and sensitive, would it be a good idea to put it through that amount of bleaching and dyeing? Because lets face it: there's no use in having the color you want on hair that's as dry and lifeless as the Sahara desert. Know your hair before you put it through - sometimes - unnecessary and damaging scenarios, with unsatisfying results in the end. * Budget: Since there's no way in hell that you're going to hair like that with a DIY (Do It Yourself) kit... A professional colorist will, without a doubt, have to step into the scene and we all know that they come with a certain price tag. Also keep in mind that you will have to get your roots retouched every couple of weeks and that you most certainly will have to purchase some hair products to repair your hair from all the damage; just think about special shampoos, conditioners, hair masks... Is it something you can handle financially? Even though we all like ourselves some pretty hair, going bankrupt isn't what you're going for. So, what do you think about grey hair before you're in your fifties? I'm pro grey with this one (and 50 Shades Of Grey has nothing to do with it). I'm dying to hear your thoughts about this topic, so leave them in the comment box below! P.S. : There's still time to enter the € 100 ASOS give away HERE. ik vind grijs ook prachtig, ik heb mezelf er al eens mee gephotoshopt en het stond me BEELDIG maar ik ga wachten tot het natuurlijk gebeurt :D eens vragen op je werk! Als ik heel eerlijk mag zijn... Ik vind het echt niet bij iedereen mooi! Sommige staan er wel mee, maar het kan volgens mij ook echt dik tegen vallen. Leuke post! Bij sommige mensen vind ik grijs haar mooi staan net zoals pastel roze, paars of baby blauw. Ik vind het wel echt mega mooie kleuren echt jammer dat je eerst je haren moet bleken voordat het mooi word :(. Wat misschien een tip is om te kijken of grijs haar je staat is: taaz.com daar kun je je haarkleuren veranderen in foto's en evt 'pruiken' opzetten. Ik ben enorm benieuwd :)! The photo you choose is simply stunning, but I'm definitely against grey hair even in the fifties :). Tag #beautyshareit to be featured on Instagram!! Love it, but I am not too brave for this! I work retail (at Anthropologie) and we've had people with edgy hair before. You should do it!! I love gray hair on women.